Respected toy construction company Mega Bloks are constantly developing new ranges of building toys to grab boys attention - and with their Dragons Universe toys they've hit upon a real winner. Taking three different themes of space, fantasy and sci-fi and rolling them into one product was no mean feat, but the result is a stimulating series of exciting toys that have to be constructed before they can be played with. Dragons Universe toys pitch the awesome Prevador Dragons against the Alliance Warriors, and a terrific selection of space ships and dragons makes for truly epic bedroom floor battles! Items like the Rapid Fire Dragon Fighter and the Alliance Hawk assault aircraft can take on the dragons called Blackheart or Clawripper. If that isn’t enough excitement, more Dragons Universe toys include the Deluxe Dual Blast Dragon Hunter or the Ultimate Dragon Destroyer which is armed with missile launchers, a special landing gear and highly realistic battle sounds. Whilst encouraging role play and imagination, Dragons Universe toys are great construction toy too and add an extra element of fun to playtime. More product development sees larger Dragons Eggs fighting for the Alliance like Starblaze and Flamedrake that not only include a dragon, but rider as well. On the Predavors side is the mighty Icestorm and Venomfang dragons both with cannons and special protective powers. The Alliance is strengthened with Speeders called Colt, Albatross and Raven whilst the Predavors fight against them with Terager, Amberblast and Hydrobolt. 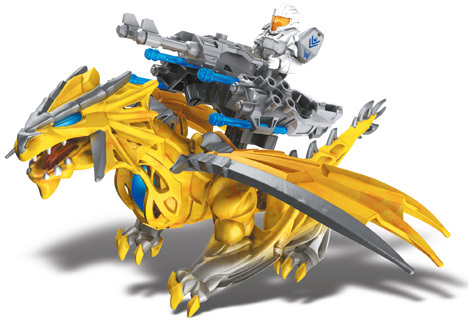 The construction sets are further reinforced on both sides with Rapid Fire Dragon Fighter and the Deluxe Dual-Blast Dragon Hunter with a functioning missile launcher. The greatest Alliance battleship of all is the Ultimate Action Dragon Destroyer with landing gear and missile launchers as well as awesome lights and electronic sounds.